Previously, RAV4 has been lauded for its quiet ride, but that didn’t stop Toyota from making further improvements. The high-strength TNGA platform is the first defense against noise intrusion. Sound-damping and soundproofing materials have been optimized throughout the vehicle, with a particular focus on minimizing noise in the frequencies that interfere with conversation in the cabin. To maximize the adventurous look, the RAV4 Adventure grade has an available Ice Edge-colored roof that is paired with one of three exterior colors: Midnight Black Metallic and Blue Flame – both of which are new for RAV4, while Lunar Rock is new to the Toyota lineup and makes its first appearance on RAV4. 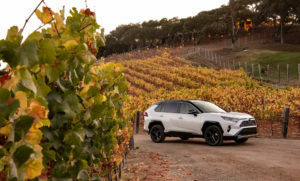 No matter the grade, every RAV4 is a winning choice, whether it’s for a city exploration, a weekend trip to the countryside, or a jaunt on the trails. 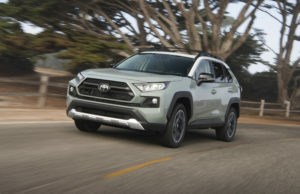 With five gas models and four hybrid models, the 2019 RAV4 arrives at dealerships with an option for everyone. Hybrid-related components, including the HV battery, battery control module, hybrid control module and inverter with converter, are covered for 8 years/100,000 miles. 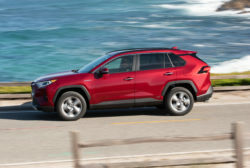 The 2019 RAV4 also comes standard with ToyotaCare, a complimentary plan covering normal factory-scheduled maintenance, and 24-hour roadside assistance – both of which are effective for two years or 25,000 miles, whichever comes first.